Like any other life-sustaining resource, says Marilyn Chandler McEntyre, language can be depleted, polluted, contaminated, eroded, and filled with artificial stimulants. Today more than ever, language needs to be rescued and restored. Drawing on a wide range of sources, both critical and literary, Caring for Words in a Culture of Lies is an engaging address to everyone concerned with preserving the vitality and precision of the spoken and written word. / If every literate person in the United States read this book, the result could dramatically transform our society. . . . 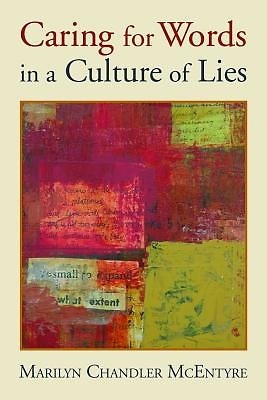 Written with modesty, keen insight, and grace, Marilyn Chandler McEntyre's Caring for Words in a Culture of Lies proposes a revolution of human expression that would bring precision, honesty, and felicity to the spoken and written discourse of contemporary culture. This is a book to read and pass on with the fervent hope that its truth may spread and endure. Emory Elliott / Director of the Center for Ideas and Society / University of California, Riverside / McEntyre's prose is lyrical, at times luminous. . . . Her thoughtful analyses of the written word invite all of us to read more deeply, and her discussion of how readers enter a text leads us to examine the architectural structure of our own work. Kathryn Reiss / Mills College author of Time Windows, PaperQuake, and Blackthorn Winter"